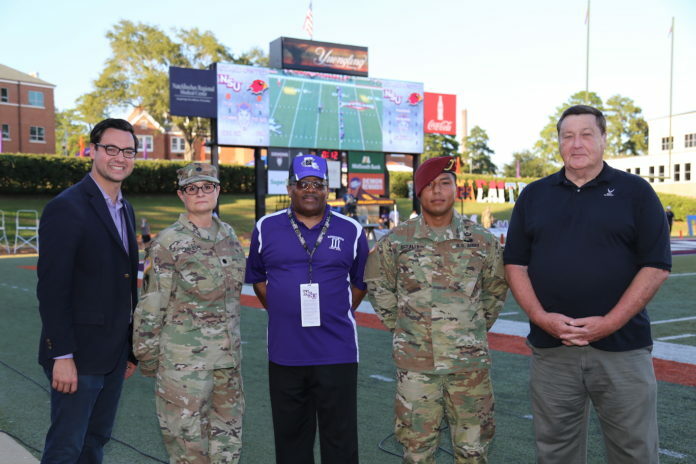 Northwestern State University honored LTC(R) Arthur Smalley, PFC Johnray Acfalle and MSG(R) John Dykes prior to Saturday’s home football game, continuing the university’s tradition of honoring veterans and servicemen at athletic events. Dykes served in the U.S. Air Force from 1967-1991. During his 24-year military career, he served as a recruiter and with security police; base services mortuary, search and recovery, courier duty and USAFE services exchange. A combat veteran, Dykes served two years with the 35th combat support wing at Phan Rang Airbase in Vietnam. Later, he was the food service director for several school districts before retiring to Natchitoches. Acfalle serves with Easy Company, first of the 509th Infantry Battalion, Airborne, at Fort Polk. He is a combat medic with 19 months in service. From left are Associate Director of Alumni Affairs Vanner Erickson, LTC Katherine Carlson, professor of Military Science; LTC(R) Arthur Smalley, chief of staff of the NSU Demon Regiment, ROTC’s alumni arm; Acfalle and Dykes.